A new Express Entry draw Conducted on Nov 28 has now pushed Canada forward in the number of invitations announced at this same time in the year 2017 — a year that fixed the contemporary Express Entry invitation record of 86,023. This 105th Express Entry draw declared 3,900 invitations to appeal for Canada PR, making the 2018 year-to-date sum to 82,000. The lowest C.R.S score was 445, a drop of 04 points over the preceding Express Entry draw that conducted on Nov 15, which had the lowest C.R.S of 449. IRCC is now solely 4,024 ITA's apart from cracking the previous year’s record entirety with one month to go in the year 2018. On average, I.R.C.C operates two invitation rounds in the Express Entry in a month, and it has announced 3,900 invitations in 06 of the last 07 all-program draws continued since Sept 5. If this trend remains through Dec, I.R.C.C will exceed its 2017 I.T.A record of 86,023. 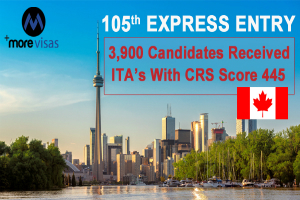 Eligible applicants are given a score beneath the System of Comprehensive Ranking that defines their place in the pool of Express Entry, and a fixed number of the biggest ranked are announced ITA's by routine draws from the pool. I.R.C.C practiced its tie-break rule in this recent invitation round. The time and date managed was 14:40:13 UTC on Oct 22, 2018. It suggests that all applicants with a score of CRS higher than 445, similarly the applicants with 445 scores who presented their profile prior to 14:40:13 UTC on Oct 22, 2018, obtained an I.T.A in this round of invitation.